July 1st is the centenary of the start of the Battle of the Somme. On that first day, almost 20,000 British and Empire troops were killed and twice as many wounded. For many of them, this was their first experience of combat. This is one of the saddest stories of that day. This monument is the Valhalla of the "Accrington Pals" (officially the 11th battalion of the East Lancs Regiment) at Serre, near the northern end of the 16-mile front. The battalion was raised in the small Lancashire town as part of Lord Kitchener's appeal for the creation of a "new army" in the autumn of 1914. Every man was a volunteer: there was no conscription yet. They were trained and saved up for the big offensive of summer 1916. 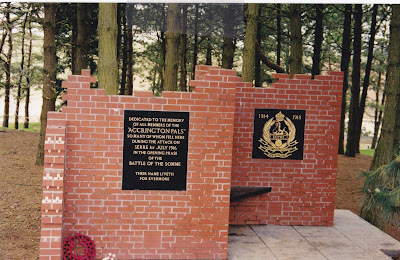 About 25 officers and 800 men of the battalion would have gone into attack "over the top" on that first morning, and 21 officers and 564 men were lost. No ground was gained. Back in Accrington the rumour spread that all their men had been killed, and angry crowds besieged the town hall, demanding to be told the truth. A few miles to the south, near Thiepval, the 36th (Ulster) division fought an epic battle when some units fought their way through the German front-line trenches only to be cut off and slaughtered by a counterattack. 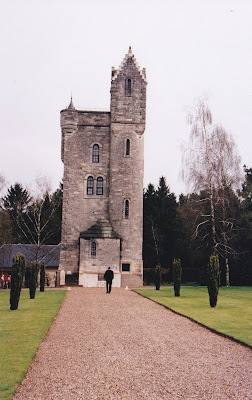 The "Ulster Tower" now stands on the site as a memorial. This happened just a few weeks after republicans in Dublin staged the Easter Rising in the hope of receiving German weapons and support, and Ulstermen have not forgotten it. More than thirty other battalions also suffered more than 500 casualties on July 1st 1916. Popular attitudes towards the war, the military high command and the governing elites at home changed irrevocably as a result.